As mentioned in our previous post we reached the milestone with our first 64bit game port! And yes, that is “Gwent”! Gwent is a fully 64 bit game and now available for Mac using Porting Kit and GOG Galaxy! Simply download the free game in Porting Kit (which is the 64bit version of GOG Galaxy) and there login with your account and get the free Gwent and download and play! GOG Galaxy is up and running again and 64bit version as well! On July 28, 2017 / GOG.com Games, News, Portingkit / Comments Off on GOG Galaxy is up and running again and 64bit version as well! Great news! With the latest Wine staging + a tweak we made GOG Galaxy alive and kicking again! Yep, the latest version is working and I updated the existing GOG Galaxy wrapper with the fix and works very nice. GOG Galaxy is has still a few small bugs from which one is that at startup it says it couldn’t update, which s not an issue because you are already running the latest version. Whats very important and a milestone on Porting Kit and Paulthetall.com is the first 64bit application is reality!! Yes we made a 64bit GOG Galaxy port where you can experiment with 64bit games. One is already working “Gwent” (for which we will make a separate post). So yes we are all excited! Please let us know your positive 64bit game results so we can check and add these games to the database as well. Lion Shield just released released a new city builder game on GOG.com called: Kingdoms and Castles! It has much from Banished and other city builder games like Anno 1503 in combination with “blocky” graphics. Kingdoms and Castles is priced $9,99 on GOG, and has high ratings of user reviews, so it looks promising. Check out the trailer below for some game-play and a first impression. Tangledeep for Mac & Linux has been released on GOG.com! “For hundreds of years, people have lived in the safety of underground settlements and villages – where the only route to the surface is “Tangledeep,” a mysterious and ever-changing labyrinth. With memories of the surface world long forgotten, you set out for the labyrinth to discover what lies above…” Although the game is still under development, it has a launch discount of -10% for a week, putting a total price tag on $11,99. Check out the trailer below for some visuals. 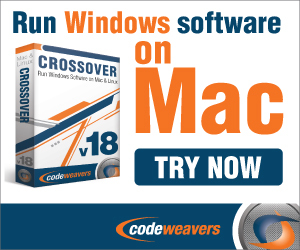 Crossover 16.2.5 released with Steam fix. On July 17, 2017 / Crossover, News / Comments Off on Crossover 16.2.5 released with Steam fix.